1523-25 N. Wicker Park Ave.
WICKER PARK — If living across from Wicker Park's namesake park and around the corner from the CTA Damen Blue Line "L" station appeals to you, as of Monday there are two condos for sale in the same 1890s-era vintage building. 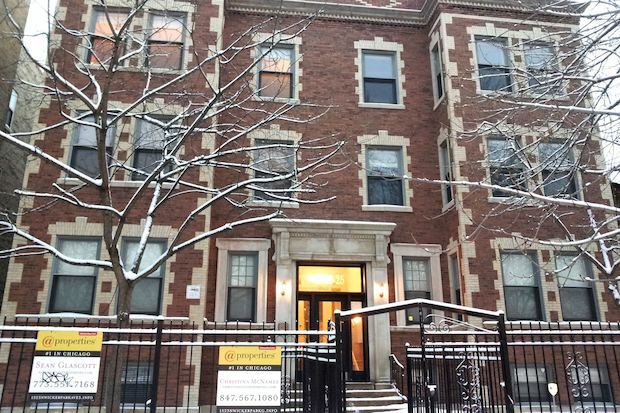 Realtor Christina McNamee put a garden unit at 1523 N. Wicker Park Ave. on the market on Monday while a top-floor unit in the same building has been for sale since August. McNamee is predicting that the two-bedroom, two-bathroom garden unit condo, listed for $329,000, will sell as quickly as a similar garden unit directly across the hall did when it sold in December for $328,000 after being on the market for 34 days. Formerly an apartment building, the four-story brick building 1523-25 N. Wicker Park Ave., just south of Damen Avenue, was rehabbed and turned into eight condos in 2005. McNamee said she believed the home's proximity to transportation, shops and restaurants would make it attractive to prospective buyers. "There is also an extra bonus den can be made into an office or a spare room. The framework of the building is very high quality," McNamee said. Among the nearly 1,200-square-foot condo's amenities are hardwood floors, kitchen cabinets made from solid cherry wood, granite counters and stainless steel appliances. Kelly Heller, the condo's owner, has been living there since 2005 and put her home up for sale because she wants to move to the suburbs where her family can have a yard. In an email to DNAinfo Chicago, Heller said she was drawn to the charm of an older building, with the modern updates on the interior. "So many condo buildings in the city all look the same outside, but this one really was different. I remember shortly after moving in, a middle-aged man was walking around the front yard. I asked him if he was looking for something and he explained that he grew up in our building," Heller said. Heller said he invited the man in to see what his former boyhood apartment looked like as a condo. "I loved hearing his stories of growing up right there in our condo. It was clearly very special to him, but that's what makes these old Chicago buildings so rich with character. A building built in 1891 has hosted so many families and seen all that this neighborhood has been through, and will become. It's a part of the neighborhood's history and that has been cool to be a part of," Heller said. Elsewhere in the same building, a top floor three-bedroom, two-bath condo has been on the market since August and has experienced four price reductions in seven months. First listed for $539,000 in August, the price was dropped to $525,000 in September, $499,000 in October, $465,000 in November and $449,000 in December. Realtor Sean Glascott said Monday that he took the home off the market on Thursday to resolve some utility issues and plans to put it back on the market within the next few days. Though more than 50 prospective buyers have toured the nearly 1,600-square-foot condo, and the seller has received two offers, Glascott said the seller is waiting for "the right buyer." "We started off high price wise. We have had enormous action but with the train tracks being right behind the building, that's been the biggest hurdle. Of all the feedback we got, it's that everyone loves the location but many don't want to deal with the train," Glascott said. Since reducing the price to $449,000, Glascott said he has seen a big uptick in showings. Among the perks offered by the top floor unit are "treetop views overlooking the park," where you can see the farmers market every spring and summer, Glascott said. Glascott said that since the CTA Damen "L" station is right around the corner from the building, what prospective buyers do not realize is that the train would not "shake" their new home. "The train does not go roaring by you because it is slowing down when it is going into the station," Glascott said.